Bring a few of these sophisticated and colorful blooms indoors and enjoy the stately beauty and rich colors of summertime in your own home. Tall, 3-4' flower spikes are covered in 3" bicolor blossoms of white generously tipped in bright purple. 10-12 flowers are open at a time, giving the garden or vase an abundant look and lush appeal. 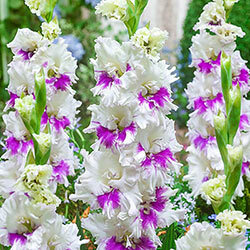 Gladiolus are quick-growing and carefree. They only need regular water, well-drained soil and a full-sun site in order to grow and thrive. Kirov is the perfect choice for jazzing up sunny borders, mixed beds and fresh floral bouquets. Deer tend to avoid gladiolus.